Mirror, mirror on the wall, which is the best non-alcoholic lager of them all? That would be our Warsteiner Fresh 0.0% – just crowned Country Winner for Germany in the category of non-alcoholic lager at the prestigious 2017 World Beer Awards (WBA). Held on August 10 in London, this high-profile contest saw more than 1,900 beers from 36 countries judged by a panel of beer experts in a series of blind-tastings. In the end, our Warsteiner Fresh 0.0% dwarfed the competition with its superb and authentic beer taste. As country winner in its category, our tasty Warsteiner Fresh 0.0% is now eligible for the exclusive final round of this global competition:100 international brewers, industry experts and journalists will taste and vote on the World’s Best Beers 2017 in eight categories. The results will be announced on September 21, so stay tuned! 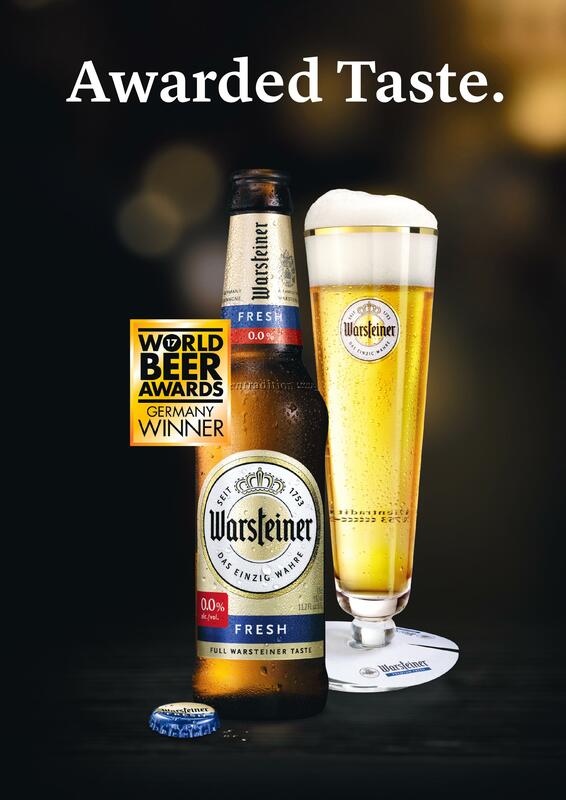 In the meantime, you may want to judge for yourself and enjoy an award-winning Warsteiner Fresh 0.0% for a truly authentic pilsener experience fit for any occasion! For more information about these renowned beer competitions, click here: http://www.worldbeerawards.com.